At less that 3 metres from its button nose to its non-existent boot, the Toyota iQ is a very short car. You know that, intellectually, when you climb aboard, but you still struggle to get your head around the full extent of its lack of length. A case in point: parking our iQ at the roadside, nosing in towards the car in front, we stopped at what felt like a sensible distance. Then we got out and saw that we’d left a yawning gap almost large enough to slot another iQ in. So we jumped back in. From the driver’s seat, the gap still looked and felt about right – you can’t see any of the car’s wee little bonnet, of course. So we nosed a bit further forward – towards what felt like imminent contact between our toes and the car in front. Satisfied, handbrake on, engine off, we jumped out. And there was still enough of a gap for an amorous couple to stroll through, arm in arm. So owning an iQ requires a recalibration of the senses. And, thinking in the other direction, it’s also probably not a good idea to spend time in an iQ and then to leap straight into something with a long and expensive prow. We suspect Aston Martin’s notion of a dollied-up iQ as a town runabout for owners of its long and low machines is not such a good idea. Perhaps our inability to think sufficiently small is proof that Toyota has succeeded in its goal of building a small car that feels big. There’s certainly plenty of width on offer – the iQ is comfortably wider than most city cars, and elbows are unlikely to feel hemmed in. What was absent during our iQ road test, sadly, was a real grown-up car feel. There are too many of the little things missing that you’ll find in every big car these days. It sounds trivial, but the vanity mirror in the sun-visor is not illuminated, for example. The seatbelts aren’t height-adjustable. The steering wheel feels lovely but doesn’t adjust for reach. And there’s no centre armrest option, despite a noticeable gap between the seats where one would happily fit. In fact there’s no enclosed storage anywhere in the car – no glovebox, no centre-console cubby, no seat-back pockets – not even an ash-tray. There are long, unlined plastic bins in the doors, of course, and a cupholder between the seats, and that’s your lot. Coins for parking will need to travel in your pocket. Overall the interior is a huge let-down, for those thinking of downsizing. Switches feel reasonable, but the larger plastic surfaces are kind to neither the eyes nor the fingers. Seat adjustment is by awful ratchety lever, and after sliding a seat to and fro to gain access to the rear you will find the seat-back has returned in its bolt-upright default. We failed to find a single fixture or fitting that surprised or delighted. Rear-seat access is OK, and there is indeed enough room in the car for three and half adults. Although with a full complement aboard, nobody but the driver will be comfortable, and luggage will have to stay at home. Viewed as a two-seater with jump seats, though, the iQ makes perfect sense – and this approach will happily minimise the need to fight with the seat ratchets. We drove a top-spec 1.3-litre car with the optional Multidrive continuously variable gearbox. We like CVTs, and slotting this one into D and forgetting about it is the perfect preparation for crawling the urban sprawl. Two-up, the car feels perfectly eager and engine noise is only intrusive if you floor it. The 1.0-litre car weighs 85kg less than the 1.3-litre version, coming in at just 845kg, making the bigger and more expensive engine something of a moot point. 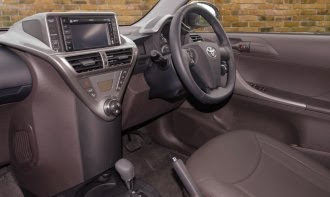 Given that the motor must be about six inches from your knees, the interior is remarkably quiet and refined, and the ultra-compact aircon unit works very well. The steering feels light and direct with typical Toyota numbness. The turning circle is an incredible 3.9m – much tighter than a London Taxi’s – but the helm still feels steady and predictable at speed. We were surprised at the high quality of the ride on offer. Even with the iQ3’s 16-inch wheels the car felt very comfortable over small lumps and bumps – although there is often the unusual feeling that both the front and rear axles are lifting and falling at the same moment, rather than one after the other. Bigger surface imperfections and speed humps do provoke noticeable pitching, but that’s unavoidable in a car with a 2-metre wheelbase. Relatively high-set seats help to combat any feelings of vulnerability created by piloting such a puny vehicle, as do the multiple airbags and the five-star NCAP rating. Our test car was fitted with every bell and whistle going, making for a rather expensive experience. The base 1.0 manual costs from £9,615 and is relatively generously equipped. For our 1.3 engine add £2,000 (which also gets you climate control, keyless entry, auto headlamps, bigger wheels and chrome mirrors). Then add £400 for our grey mica paint, £1,000 for the auto box, £345 for mats, £690 for leather seats, £495 for a stupid spoiler and skirt, and £930 for the full satnav, Bluetooth and iPod experience. All in all, that’s a surprisingly hefty £15,475. In other words, a lot of money for a tiny, two-seat runabout. There’s a lot to like about the iQ, but in the end it left us unconvinced. It’s not plush or posh enough for well-heeled drivers hoping for the perfect city runabout. They’ll still go and buy a Mini. And it’s too compromised for people who would otherwise spend the same money on a Fiesta or Corsa. It’s a better car than its Aygo sibling, but it costs a heck of a lot more to buy. So for the moment there are some nearby stools, but this little car seems to be falling between them. And, unusually, all the problems are on the inside. We wonder if an early interior facelift might be in the works at Toyota HQ.